Friday October 13th 1893 I went over home today and Will went to the valley for a load of wood. I finished Will shirts and came home before it was late. I read all the evening. Mrs Fuller is not well. Saturday October 14th 1893 I was busy about my work all forenoon, did some baking. Will hitched Pet for me to go over the river in the afternoon. There was a very cold wind, Fanny went to the depot to meet Hattie who had been up to Waterloo. I spent the evening at home. Mrs Fuller is no better. Sunday October 15th 1893 It was a bright cool day. Will and I went down to Aunt Ems. They were all gone to church. We got in the house and waited for them to come back. Spent a pleasant afternoon and came home by the upper road. Went to church in the evening. Mr Pratt preached for the last time. 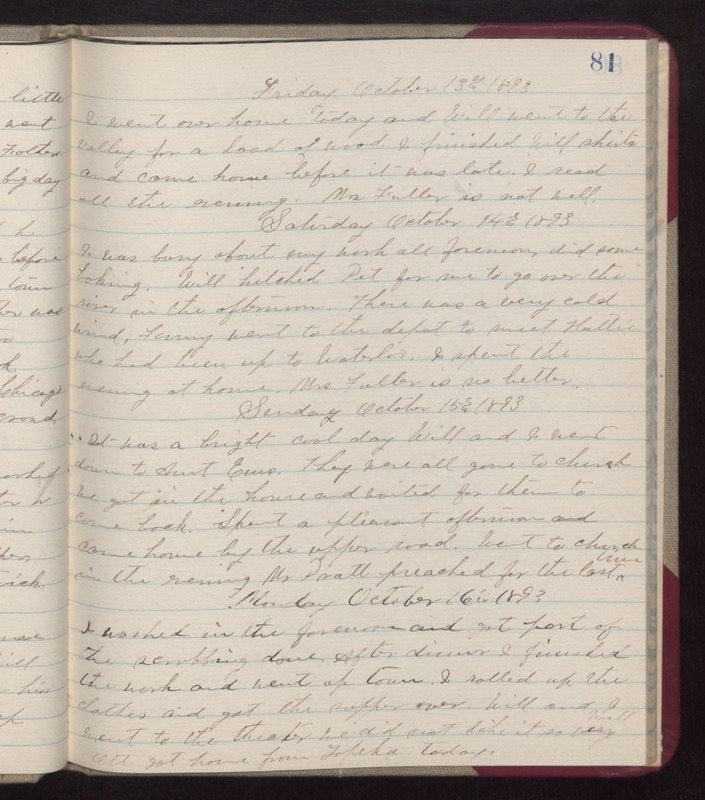 Monday October 16th 1893 I washed in the forenoon and got part of the scrubbing done. After dinner I finished the work and went up town. I rolled up the clothes and got the supper over. Will and I went to the theater we did not like it so very well. Ott got home from Topeka today.